This fall, I taught a revised physics of sound course. The revision was due to changes to Wheaton’s core curriculum program. The course expanded from 2 to 4 credit hours. It also took on new content, since it has both a Science Practice and an Advanced Integrative Seminar tag. Below are pictures of the student projects. 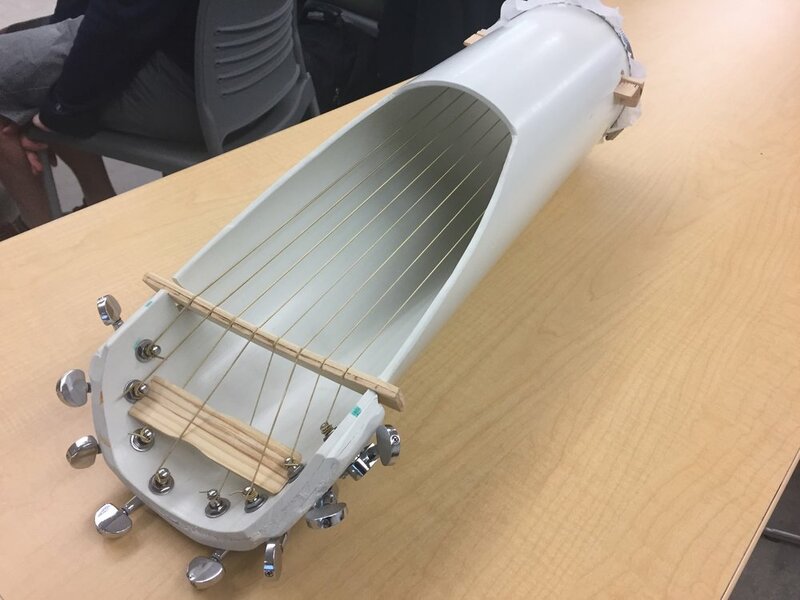 In years past, students in my two credit hour physics of music course made projects as well, but the longer term allowed us to have more time to design, test, and refine the instruments. The students also were able to make use of the very excellent engineering lab at Wheaton. It is interesting to me how sometimes a course will take on themes that I don’t plan for. From these projects, I believe the students and I all gained a greater appreciation for the role of resonance to make sounds louder and the challenges with the choice of materials that will enhance resonance while being easy to work with and affordable. The hardware store is a natural place for students to first look for materials, but that largely restricts them to materials like PVC. When I teach the course again next fall, we’ll focus initial design on identifying and selecting materials that will enhance resonance.